Felix Rosenqvist put on a bid for victory in the second race of the New York City ePrix double-header on Sunday, battling Britain’s Sam Bird in a gripping event and finally coming home second to score the fourth podium of his Formula E career. Determined to move on from the disappointment of Saturday’s opening race at the Brooklyn street track, in which he languished to 15th after making contact with the wall, Rosenqvist sealed a front row grid slot for Sunday’s encounter by going second fastest in the morning’s qualifying session – just a mere 0.037s adrift of pole-setter Bird’s benchmark time. Hopes of a race-winning performance were further boosted when Rosenqvist grabbed the lead courtesy of a swift start, but Bird remained in close pursuit and eventually regained the advantage with a dive down the inside of Rosenqvist on lap 11 out of 49. The pendulum then appeared to swing once again, with Rosenqvist – in turn closely followed by Mahindra Racing team-mate Nick Heidfeld (GER) – comfortably able to stay within a second behind Bird throughout the first stint before opting to take his compulsory pit stop during a Full Course Yellow situation. Bird pitted a lap later, also under FCY conditions, and retained the lead with Rosenqvist and Heidfeld still right on the Englishman’s tail – setting up a potentially intense conclusion to the race. However, Rosenqvist later ran into technical drama with uncertainty surrounding his battery energy levels, forcing the Swede to slow while Mahindra Racing engineers worked frenetically to get on top of the situation. The team switched Heidfeld ahead of Rosenqvist to try and pressurise the fleeing Bird, but later reinstalled Rosenqvist in second in the closing stages once the battery issues had been addressed. By then, Bird had already carved out a decisive gap, going on to claim victory 11 seconds ahead of Rosenqvist. 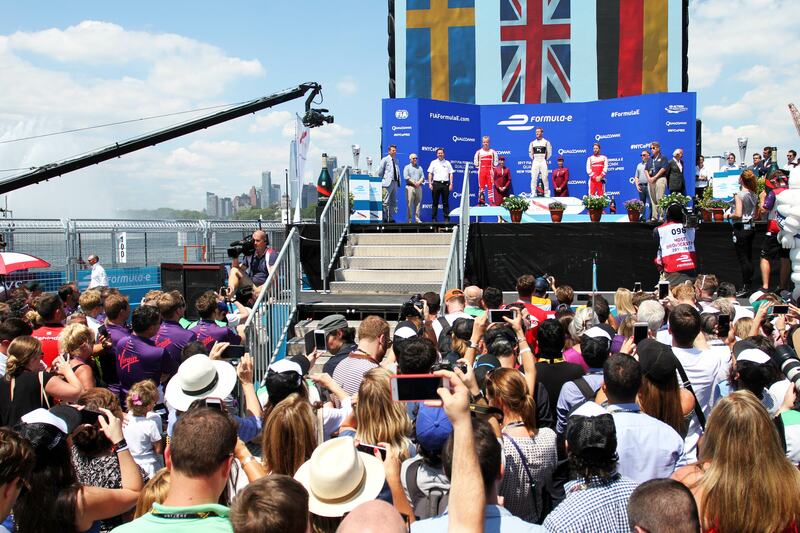 Sunday’s result means that Rosenqvist has now graced the Formula E podium in three out of the last four races. With only one round remaining of the 2016-17 FIA Formula E Championship – the final double-header in the Canadian city of Montreal – Felix Rosenqvist holds third in the overall standings and is technically still in with an outside shot at the title during his rookie campaign in the series. The gap to championship leader Sébastien Buemi (SUI), however, amounts to 53 points with just a maximum 58 up for grabs in Montreal. The Montreal ePrix takes place on July 29-30.